I know I have no right to gripe and complain about the cold since so many people have it so much worse than we do here in Charlotte. Multiple feet of snow? Negative double-digit temperatures? No thank you, and no thank you. I suppose I might grow accustomed to bone-chilling weather like they have in the northern parts of the country, but I'll be honest: I don't wanna. I've heard lots of people say that they'd rather be cold than hot, but not I. I like to have feeling in my toes and fingertips much more than I mind a little armpit sweat and a moist upper lip. So even though I have no right to gripe and complain, I seem to be doing it anyway. Sorry. Ignore all that and focus on the food, a body-and-soul-warming vat o' chili. Every person in the world who eats the stuff has his or her preferences regarding how chili should taste, myself definitely included. 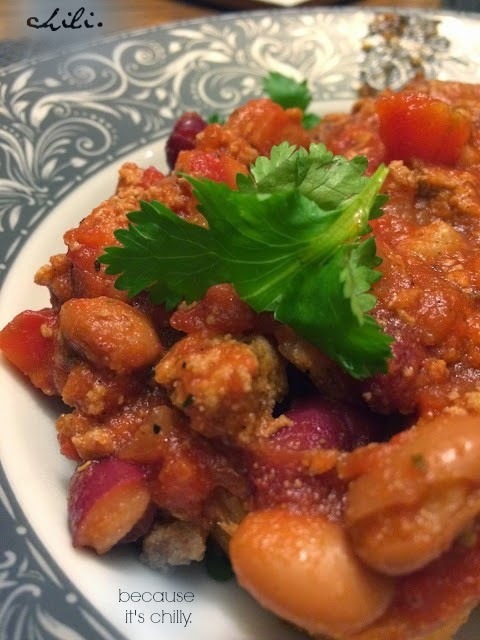 For me, beans are absolutely essential, and two kinds; one variety will always be kidney beans and the other kind is a toss-up--black beans, pinto beans, navy beans, and even chickpeas have all made an appearance before. There should be something spicy involved, too, as well as a little something sweet. I like a thick consistency, but juicy enough that the piece of bread under my serving gets saturated. I don't get worked up about the meat being used. It's usually beef, though this time I used turkey and found it to be just as satisfying and delicious. Topping options are many, but I stick with cilantro and a little cheese, plus some diced avocado, if I have it. Icicles have actually formed on my (shamefully wrinkled) garden flag. Do as the snowman says, folks. There really aren't many dishes more comforting during and appropriate for the nasty weather we're getting. I'll even go so far as to say that it makes the snow, ice, and frigid air almost tolerable. Almost. Heat the oil in a Dutch oven over medium heat until shimmering. Add the onion and cook, stirring occasionally, until softened, about 8 minutes. Add the ground turkey and cook, breaking the meat into small pieces with a wooden spoon, until the meat is no longer pink, about 7 minutes. Drain. Add the seasonings, crushed tomatoes, diced tomatoes and their juices, tomato sauce, water or beer, and beans, and stir to combine. Cover and cook until the chili thickens and the flavors meld, about 2 hours. Taste and season as needed. I can't say we have multiple feet of snow here in Toronto, but it's plenty cold. I can't wait for spring! Here I can feel spring already, esp. during midday, the temp. reaches 5C. The chilli looks very warming and comforting. Lots of snow here and -2 here now, but it's a sunny pretty day. I grew up in heat and high humidity, good and bad to both cold/hot! We're happy here in Chicago area! Your chili looks delicious, Grace and perfect for winter fuel! Wish I had some of your chili for lunch today, Grace. Like you, I feel ridiculous for complaining when the NE has it so much worse than we do, but South Florida in the 30's this morning? That's rare! This looks amazing for a cold day.Today's water in CT is -3° . Chili is the best and I love Charlotte. NC is my original home! It's been cold in Wisconsin, but the snow has been reasonable--and we rarely get the ice they do farther south. But I think Chili as comfort food is a universal! Yes, I definitely cannot complain...although it is not that cold here in Southern California...I still would enjoy a bowl of this hearty chili...looks delicious! I'm just waiting for the day we reach into the teens again - maybe tomorrow? Chili is good any time. My son adds diced sweet potatoes and diced tomatoes to his, and it's a really good touch. OK, just so all are clear.... THIS is chili country. With temps yesterday at -27C ( 17 below zero) and snow up to our armpits, we LOVE and need chili. Have made different types and this looks like a winner. Also have used pineapple in mine.